This startup has developed simulators for surgeries to help doctors understand how a procedure is done without having to experiment on the patient. The problem it solves: Builds next-gen simulation platforms with a focus on an endoscopy simulation platform. Funding: Rs 1 crore from the Department of Science and Technology and Government of Karnataka. When it comes to seeking medical attention, it comes as no surprise that most patients insist on only seeing a senior doctor. While this makes perfect sense from a patient’s perspective, for a junior doctor, it spells a Catch 22 situation as practice makes perfect but patients refuse to allow them the practice. 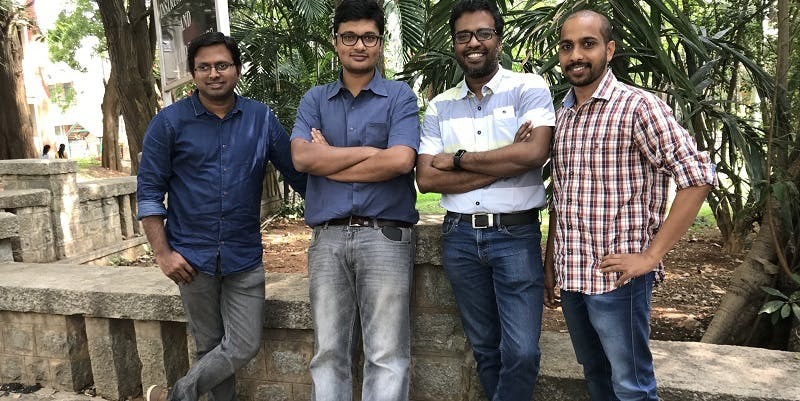 Mimyk, a medical-tech startup incubated at the SID-IISc in Malleswaram, Bengaluru, is helping ease this situation. It has created simulations for surgeries to help doctors understand how a procedure is done without having to perform it on actual patients. The company combines haptics, design, and virtual reality to build advanced simulation platforms. The objective of the startup is to increase the precision of surgical outcomes. The founders – Shanthanu Chakravarthy, Balaji Gopal, Nithin Shivashankar, and Raghu Menon – are not the usual startup founders. They are scientists first, and marketing experts next. They have been associated with the Indian Institute of Science (IISc) for more than a decade now, and met while working on a common project. Shanthanu was building a simulation platform for invasive surgery in 2015, and that is where the team’s entrepreneurial journey began. The founders’ skills include core engineering and also a varied set including hardware and software capabilities. Shanthanu is a mechanical engineer, and has a PhD from the Indian Institute of Science, Bengaluru. For his PhD, Shanthanu studied haptics and simulation-related issues for developing an endoscopy simulator. The first product from Mimyk will be based on the endoscopy simulator developed during his research. Balaji Gopal worked on a number of devices such as a micro pump for insulin delivery applications, pipe inspection Robot, and MEMS manufacturing. Nithin Shivashankar received his PhD degree from the Department of Computer Science and Automation, IISc, and is an expert in computational topology and scientific visualisation. Raghu Menon studied product design at the University Of Cambridge, UK and is a trained engineer and product designer. He received his degree from the Centre for Product Design and Manufacturing (CPDM), IISc, Bengaluru. “We want to build a product for India to help doctors understand invasive surgery through simulation,” says Raghu. The founders decided to first build a product around gastroenterology, thanks to the project that Shanthanu was working on. He met Nithin to build a visualisation platform for immersive surgeries for his research and that is when they realised they could build a simulation platform for training. By the end of 2015, they roped in Raghu and Balaji to create the product design. Haptic sensors: The haptic system acts as an interface for human and machine interaction. A haptic interface consists of a haptic device (a mechanical manipulator with sensors and actuators), and a computer that runs the control system governing the interaction with a virtual world. Immersive simulation: Immersive medical simulations involve algorithms and software for haptic interaction with virtual organs. For surgical simulations, research has been focused on developing interaction models for tool-tissue interactions. However, haptic simulation is a user-in-the-loop operation, where the user is part of the closed-loop dynamical system. Any instability in the interaction is directly perceived by the user in the form of random oscillations. Integrated design: The oscilloscope was designed to make doctors use it in real-world situations. For this integrated design approach, the team brings together design specialists from various domains including user perspectives. “It took us a good three years to build the product,” says Shanthanu. “It was visualising all these simulations that combines a lot of physics and algorithms, and you have to make it as real as the real world. It is just like training an aspiring pilot on a simulated runway. But it is way more complicated because it involves the human body,” says Nithin, the software brain behind the project. The product has been successfully tested at the Asian Institute of Gastroenterology, Hyderabad, which is one of the largest referral centres in Asia for Therapeutic Endoscopy. The business plan for the team is to take the platform to 350-odd medical colleges across India, and then to the world. 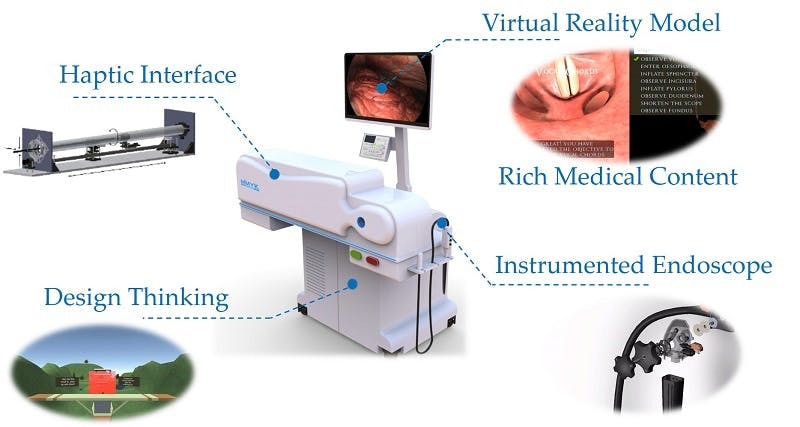 A real endoscopy machine costs a few crore rupees, but this training-simulation module comes at a tenth of the cost. “This can improve care as our doctors get better,” says CS Murali, Chairman of SID-IISc, entrepreneurship cell. The medical devices industry in India is currently valued at $5.2 billion by the Government of India, and contributes 4-5 percent to the $96.7 billion Indian healthcare industry. Currently, India has about 750-800 medical device manufacturers, with an average investment of Rs 17 crore to Rs 20 crore, and an average turnover of Rs 45 crore to Rs 50 crore. As per industry estimates, the Indian medical devices market will grow to $50 billion by 2025. Currently, India is counted among the top 20 global medical devices market and is the fourth largest medical devices market in Asia after Japan, China and South Korea. “Startups in the core engineering field are great at technology, and they have to figure out making money from the product,” says Naganand Doraswamy, founder of IdeaSpring Capital. The good thing is Indian research is finally taking off. Mimyk is in the pre-revenue stage, and in FY2019, the product will go live in the market.